CLEARWATER, Florida – September 24, 2018 – Today Hawk Epoxy, the high value epoxy solution provider, welcomed Donovan Marine, Inc. as its newest authorized distributor wholesaling its comprehensive line of premium quality epoxy resin, catalysts, fillers, and metering pumps to the company’s marine-focused recreational, commercial, and international customers. Donovan Marine will provide customers with just-in-time availability and support via its network of nineteen stocking distribution centers and six call centers in the United States. “Donovan Marine is the ideal addition to the Hawk Epoxy family of distributors,” said Erik Norrie, New Nautical Coatings CEO. “As one of the largest marine products distributors, Donovan Marine has the geographic reach to provide marine service professionals in both the recreational and commercial markets with just-in-time availability of our Hawk Epoxy products,” Norrie added. Donovan Marine provides value to its customers with hundreds of years of combined marine know-how, nineteen regional distribution centers, and six call centers serving both domestic and international customers. The Donovan Marine Family of companies include: Donovan Marine, Inc., Skipper Engineered Products, Donovan Marine Services, and Donovan Marine Propeller Service. A trendsetter of marine coatings, New Nautical Coatings, Inc. was established in 1978 and is dedicated to bringing only the highest quality products and customer satisfaction to today’s mariner. New Nautical Coatings is family owned and operated with a commitment to excellence. It provides a wide array of application specific marine coating products that include Hawk Epoxy, Sea Hawk antifouling systems, primers, solvents, and resins. 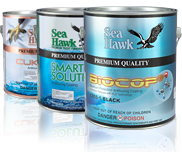 Now offering innovative products globally, the Sea Hawk and Hawk Epoxy brands have enjoyed unprecedented growth and continues to grow as its products become more in demand worldwide. For more information, contact Michael O’Keene at MichaelOKeene@SeaHawkPaints.com and (727) 523-8053 or visit www.seahawkpaints.com.